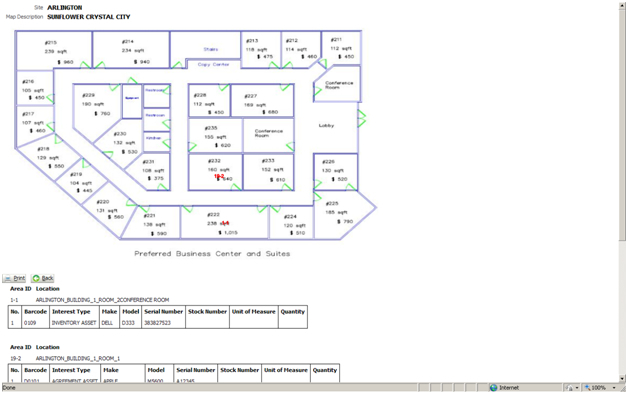 Sunflower Asset Mapping allows organizations to leverage the information stored in Sunflower to produce a visual representation of their assets in a way unique to their office, warehouse, building, campus or other structure. Physical location information is aggregated and represented so that assets can be easily located for mission critical events. Sunflower simplifies enterprise asset management tasks including asset management, personal property management, real property management, contract property management, configuration management, lifecycle asset management, government property management, weapons management, and more. Our asset management services and enterprise asset management software applies to all industries. Contact us for information on the industry’s best enterprise asset management system.